The Praxis Framework is a single approach designed to support project, programme and portfolio management. Our Praxis Framework training courses are aligned and accredited to the APMG Praxis Framework syllabus. Praxis Framework Bridging 3 day course. 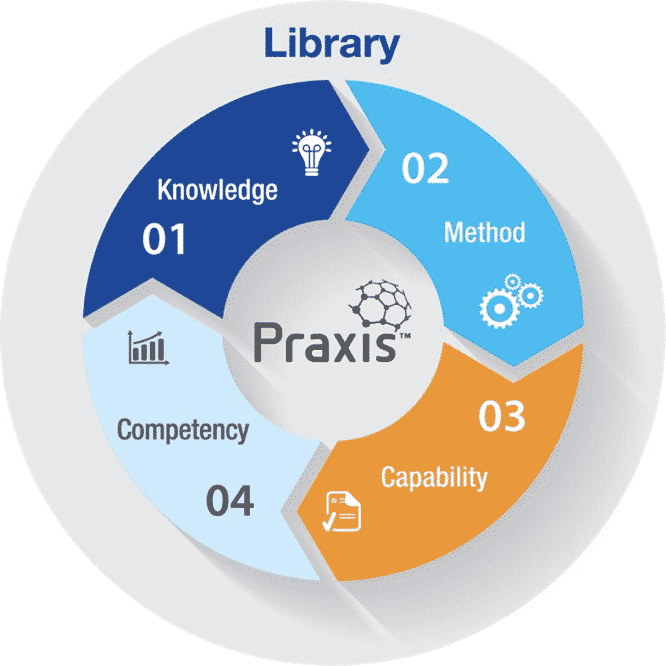 The Praxis Framework certification courses are focused towards the project and programme management layers of the Praxis Framework with coverage of the interfaces with portfolio management. We also have available a 1 day Praxis Framework Overview course and ½ day Praxis Framework Senior Management Workshop. Contact us for more information. This is a 3 day program ending with the APMG Praxis Framework Foundation exam. The Foundation exam is completed at the end of the 3 day Foundation program. This exam is a 60 minute multiple choice exam with 75 questions. To attain Praxis Framework Foundation certification a pass mark of 50% (38 or more marks) is required. This is a 2 day program ending with the APMG Praxis Framework Practitioner exam. The Praxis Framework Practitioner exam is completed at the end of the Practitioner course. The Practitioner exam is a 2.5 hour objective style exam with 4 questions. A pass mark of 50% or more from a total of 80 marks is required to attain the Praxis Framework Practitioner certification. Passing the Praxis Framework Foundation exam is a pre-requisite to completing the Praxis Framework Practitioner exam. Delegates who wish to use either of the above certifications as a pre-requisite qualification to enrol directly into a Praxis Framework Practitioner course, will receive a pre-course reading list to help prepare for the Praxis Framework Practitioner training and exam. Alternatively, delegates with these pre-requisites may directly enrol in our 3 day Praxis Framework Bridging Course. Current and aspiring project and programme managers. Staff involved in the design and implementation of project, programme and portfolio delivery frameworks. Project board members, project & programme senior responsible owners, change managers, project team members, project and programme assurance staff, PMO (project, programme or portfolio management office) members. This 5 day program is a discounted package combining the 3 day Praxis Framework Foundation course with our 2 day Praxis Framework Practitioner course at a special price. View our training schedule for pricing information. The Praxis Practitioner Bridging course allows delegates with the above certifications complete the Praxis Framework Practitioner exam without needing to complete the Praxis Framework Foundation exam. The 3 day Bridging course has similar aims as the 2 day Practitioner course, though providing delegates with recognised certifications additional information that outlines similarities and differences between the Praxis Framework and prominent project and programme management standards. Allowing delegates to ‘bridge’ any knowledge gaps between their current certification and the Praxis Framework. The Bridging course is completed with the Praxis Framework Practitioner exam.